ATRUE Black Tea fermentation is accomplished through our diligent work and a series of carefully crafted methods. The carefully selected tea leaves are fermented twice, enabling their natural ingredients to be delivered to the skin revitalizing it with the tea¢®s essential nutrients, keeping it healthy. Plucking: We select the finest tea leaves harvested within the Castleton Tea Gardens which boast of fertile soil, moderate wind, and lots of sunshine. The climate is suitable and the temperATRUEs are excellent, enabling the tea to grow as well as it can. Withering: The newly chosen leaves are then heated by the hot winds for up to 40 minutes, reducing the moisture content. Rolling: The purpose of rolling is to achieve a final curved appearance as well as to break the leaf¢®s cell walls. This is essential to release key oils which start the chemical reaction of fermentation. Fermentation: Oxidization occurs around temperATRUEs of 25~30¢® and humidity levels of 95% for 30~100 minutes. 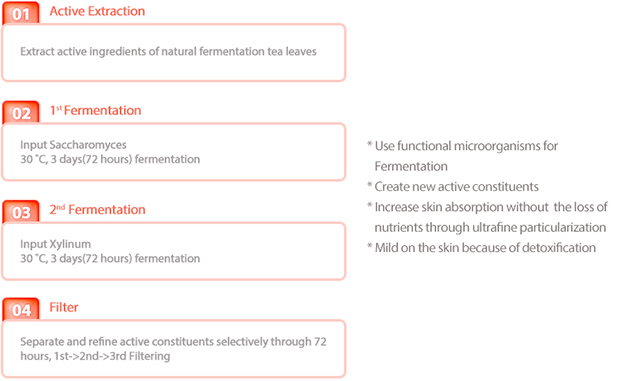 Through the core skills and precise fermentation processes of ATRUE, the Black tea comes to life containing even more nutrients which are active constituents for healthier skin. The tea leaves are reproduced enabling very effective nutritional transfer to the skin. Our superior mask is formulated using up to 73% of Compagnie Coloniale Black Tea Fermentation and 3-activator. The mask itself comes with all the benefits of the Real Black Tea True Active Essence. Using the True Active Mask just once can deliver a natural vital power to the skin which helps restore its vitality giving it a more natural and radiant glow. 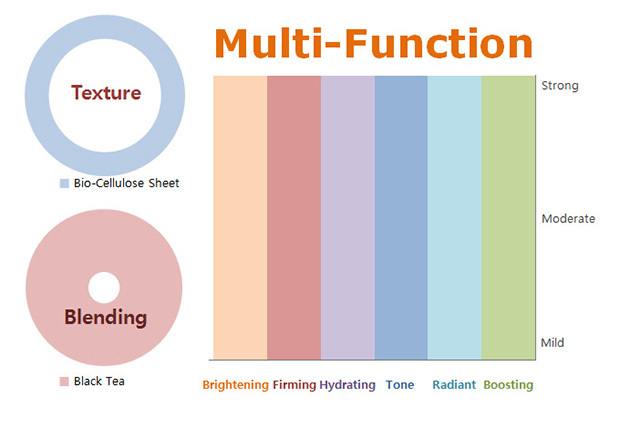 Our 100% bio-cellulose is cultivated from acetobacter xylinum bacteria yielding fermented fibers from natural sources. They are safe and gentle to your complexion. The nano-sized fibers closely conform to your face with superior moisture retention abilities. Place the mask over your face. Remove it after 15 minutes. Massage the remaining product until it is completely absorbed. Remove the protective film from the mask. Appropriately place the mask on your entire face. Remove the net from the surface. Press gently to get the mask to attach evenly and leave it on for 15~20 minutes before finally removing it. Upon gently removing the mask, massage the excess product onto the skin until it is completely absorbed.